There was a marked increase in new in-house roles coming on board, at both the junior and senior end of the market. The conclusion of the third quarter saw the busiest month of the year so far (September) come to an end. There was a marked increase in new in-house roles coming on board, at both the junior and senior end of the market. We also saw a number of smaller firms that had not recruited over the past few years starting to put their heads above the parapet. Our clients continue to be optimistic and are looking to ramp up their departments. Shortages of good solicitors remain in the areas of Corporate Law, Tax, Financial Services Regulation and Capital Markets. Experienced Funds Lawyers are constantly in demand with both law firms and in-house. There has been a lot movement of solicitors moving from Mid-Tier firms to Top 6 firms (many of whom are keen to gain bigger ticket experience) and a contra flow of candidates from the Big 6 to the mid-tier firms in order to have a better work-life balance. Law firms continue to seek new partners who have a nook of clients or are proven business developers, as they seek to regain some market share lost over the past number of years. These roles have been at both equity and salaried partner levels. While there has been movement at partner level in the market it has not been as active at this level as last year. This is most likely due to firms matching the financial and career aspirations of junior partners and therefore powdering any ‘itchy feet’. Salaries continue to rise for junior solicitors in the commercial law firms. We are now seeing a situation where many junior solicitors are now earning the same salary as their colleagues who have 2-3 years more experience than them. At the junior end it is definitely a “candidates’ market”. As we head into the final quarter of the year, the market is continuing to grow steadily, clients and candidates alike are optimistic and long may the growth and optimism remain. If you are thinking of a move this Q4, for a confidential discussion please contact me on jmacklin@lincoln.ie or call 01 661 0444. John is a Director and Head of the Legal division at Lincoln Ireland. 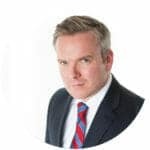 He is also a qualified New York State Attorney and holds a Masters in Commercial Law from University College Dublin, an M.B.A. from Trinity College Dublin. John has over 10 years’ experience in the recruitment of legal partners across top tier firms, mid-tier firms and boutique practices across Ireland and further afield. Since joining Lincoln in 2013, John has also acted as company side advisor to many small to mid-level practices advising on mergers and acquisitions.